To resume 2018, Masta T Kicks Off From Where He Stopped In 2017 following The Successful Release Of His Feature On The Hit Track OSHOZONDI, With Other Banging Features like JEJE With DJ SIDEZ. 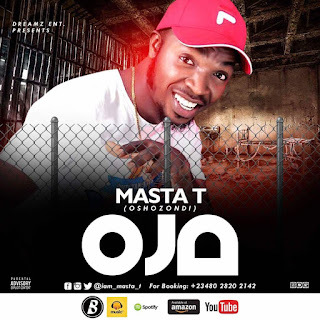 Dreamz Entertainment Act And Producer Masta T Comes Out With OJA WHich Is Set To Take Over The Streets. Masta Is No Doubt One Of The Fastest Rising Music Act In The Nigeria Music Industry Which His Last Song OSHOZONDI Is Still Trending.